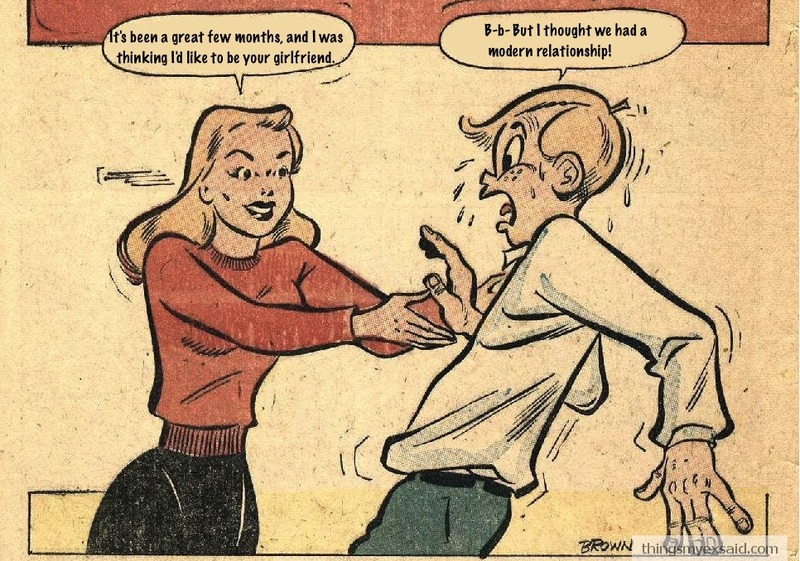 But is there really something worth being called a “modern relationship”? Are relationships so different today that they deserve this title? Or are we only having the same relationships we’ve always had, in a modern setting? I’d like to think a truly “modern relationship” is ideally post-feminist one, where lovers are partners in a truer sense of the word than ever before. But you can’t read the news or watch TV without knowing that post-feminism isn’t remotely close to where we’ve arrived, as a people. But it makes me sad to think, that to some people, the idea of modernity and fidelity are not only set apart from each other, but possibly even opposites. Or is it possible, in this day of statuses and tweeting and “liking” as a button rather than a feeling, that the offender above meant a modern relationship was one that lacked any interpersonal investment at all? But really, all of this begs the question to me: if that is a modern relationship, what the hell is post-modern relationship? Cave-man-esque scenes are brought to mind. Or is that love with robots?